1.30" x 5.40" x 4.01"
Cons: Died after 1 year. Called customer support but they asked for $79 support for 6 months. I will try to call them again to find out how to get a replacement unit. Other Thoughts: Please do not buy this switch. Cons: - Did not last more than 1 year and 6 months. I have seen switches last up to 1, sometimes 2 decades. Granted, this is a consumer-level product--but that doesn't mean it should fail in less than 2 years. Do not buy! Other Thoughts: Switched randomly failed while it was in use. After narrowing the problem down to just the devices running off of this switch, I noticed the power LED was lit and none of the LAN LEDs were. Rebooting did not solve it even after cooling down--and there is no reset switch or anything of the sort. The capacitor in circuit is an Ltec LZG, 16v at 470uf. It tests good, and the same problem also occurs when using the unit with another 7.5V AC-DC adapter. This is a chipset failure; for the asking price, unacceptable. Cons: I bought this to wire into my entertainment center to give network access to things like my DVR, Satellite box, TV, etc etc. The hub has plenty of room to breathe, it's not like it could have gotten hot. It took me a few hours to get everything put back into place and the unit lasted about a month and went out. Very suprising because I have other Netgear stuff and love it. This unit was NOT worth the money. Pros: Cheap. Reliable. Does what it is supposed to. What more could you ask for? Other Thoughts: I bought this switch to be able to connect a PC, my Smart TV and My Hopper to the internet. I have several computers all in different rooms that are all hardwired to my router. I didn't want to have run 3 more lines from router to the living room so I used the PC cable that was already there and hooked it up to this switch. I had some smaller cords laying around to connect everything to the switch so this was way cheaper then buying 3 more 50 foot Ethernet cables. Pros: I recently set up a home classroom with four desktop computers. The existing patch cables were not long enough to reach the router, so I went with this solution rather than buying a bundle of 30' patch cables and I'm glad I did. The network has been rock solid and seems more stable and responsive than it was when the computers were patched directly into the router. Other Thoughts: Nice, small box. Wall mounts with a couple of screws. Pros: This switch is very reliable and easy to use and great value. It has built in QOS (Quality of Service) which can be very handy if you have a child running online gaming and sucking down all your bandwidth, or if you use VOIP. Cons: The QOS can also be a con if you do not want it because you cannot disable it. Other Thoughts: If you know ahead of time what you are purchasing (like I did) then I would think no one would have any issue with this switch. The QOS can be a PRO for some people and a CON for others. Pros: This switch worked fine for about a year. Cons: After 15 months of usage, the switch started to cause issues on my network. It would cause the router to loose all connectivity on the intranet and internet access on both wired and wireless connections. I had to 'reboot' the router in order to get connectivity back - but after a hour, the issue would repeat itself. It took me several days to isolate the issue to the NETGEAR GS605AV switch. Other Thoughts: I called NETGEAR customer support to have this unit exchange (2 year warranty on the switch). I was on text support with NETGEAR tech support over over 45 minutes and nothing was resolved. The support person was inattentive and DRAG everything out to wear you down in giving up trying to have them honor the warranty. I finally gave up. I'm going to throw the switch into the trash. 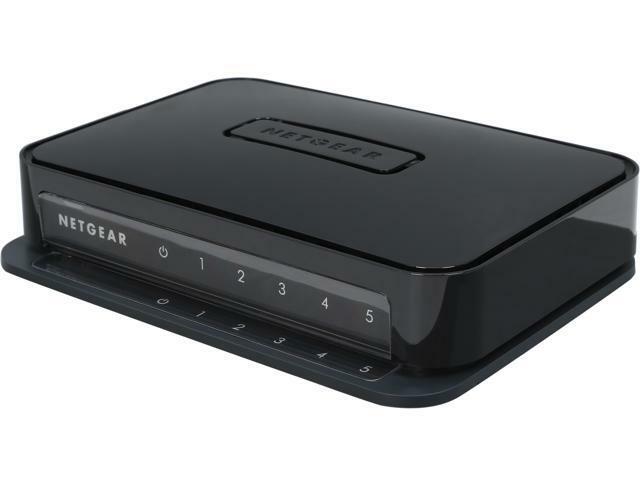 Based on my experience, I WILL NEVER BUY ANOTHER NETGEAR PRODUCT AGAIN. Pros: It does it's job. Works without any fuss. Cons: Wish there was a four port version. Not sure why the ports needs a QoS where you can't adjust it. Other Thoughts: I got this to match with my WNDR3700v3. Have it connected to my Workstation and future peripherals. It looks nice, and really isn't much more you can ask from it.